I'm sitting here, sipping lemonade, and hoping to break through the brick wall. Writer's block. It started in November when our "one year since we found out about Down syndrome" anniversary rolled around. It loosened up briefly in March when I was trying hard to write for World Down Syndrome Day. A lot has happened since then. A lot, and then again not so much. Our lives are so normal. School drop-offs and pick-ups. Doctor appointments. And the occasional freak-out over petechiae. Me, too. A year ago I had no idea what petechiae were. Now I can talk petechiae with doctors. 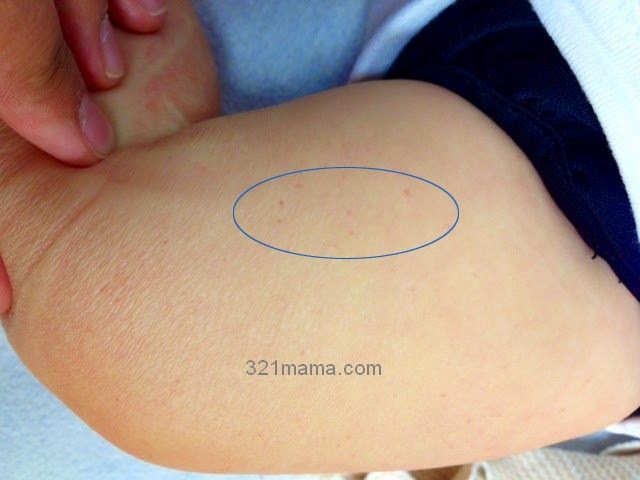 Petechiae (plural) is small red dots on the skin. They look like a rash, but when pressed on, a rash will whiten. Petechiae do not. They stay bright red. They're caused by tiny tears in the skin that bleed a tiny amount. They happen when you drink out of a gatorade bottle and your upper lip gets sucked into the bottle. They happen when your best friend in 3rd grade gives you an Indian burn. And they can happen when your child has leukemia. 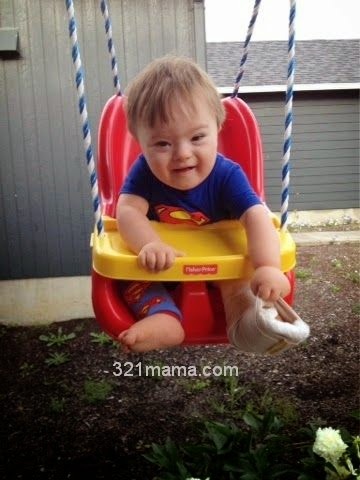 Kids with Down syndrome have 20 times the risk of leukemia. So when I see petechiae pop up all over Cade's body, I freak. The test is super easy...a few blood drops and a CBC (complete blood count). But getting blood from Cade is kind of like getting it from a turnip. Oy. We've managed enough blood for 3 CBC's over the past 2 months. Thankfully all have been normal. No explanation for why he suddenly has petechiae. When he was in the ER for his broken leg (oh yeah, that's a whole other story) the ER doc was so freaked out by the petechiae that he mentioned it more times in his report than he did the broken leg. It was ME who assured HIM that Cade was fine. Cade's also showing borderline hypothyroidism. He's had a bunch of TSH tests over the last few months. They've ranged from barely normal to really high. I think he should be treated for hypothyroidism but the endocrinologist disagrees. We're at an impasse for now. I'm allowing it because Cade's not really showing many symptoms yet. And the leg. Three weeks ago I lost my Mother of the Year award. I nursed Cade to sleep in bed, then tucked him in and left him there. You see, Cade's a terrible sleeper right now. He needs every moment of shut-eye that he can get. So when he fell asleep in the big bed, I wanted him to get a good nap and I left him there. I literally checked on him every couple of minutes over the next 20. But in between checks, he woke up and rolled once, twice, three times and thumped to the floor. Within minutes we knew he wasn't just scared, but actually hurt. Urgent Care sent us to the ER. ER quickly determined the leg was broken. Broken. A hundred people have told me that their kids have rolled off the bed and were fine. But not Cade. Was it somehow his Down syndrome that made the difference? Did he land just right? 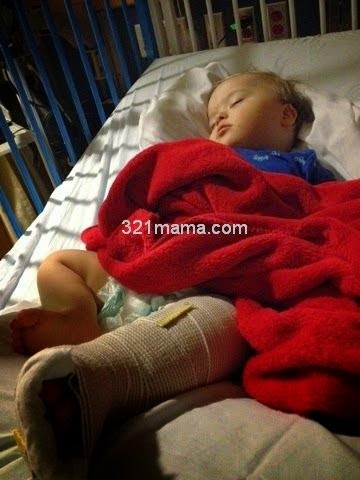 Cade was hospitalized overnight while they gained control over his pain and made sure we weren't abusive. We went home the next day. Long story sort of short, he spent three weeks in a splint. They never did cast it and he's fine now. 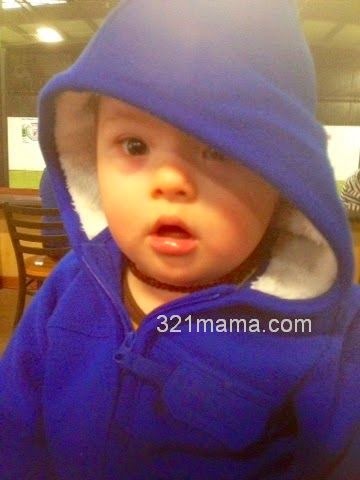 As if all that wasn't enough, Cade's failed his 6-month and 12-month hearing tests. After much discussion between the audiologist, ENT, and pediatrician, it was decided that Cade would go under sedation for a special hearing test (an ABR) and possibly tube placement. So last week, we went back to the hospital. I watched as they put my baby to sleep with sevoflurane gas. Then I left the room and they worked on him for 90 minutes. Most of this was the hearing test. An hour later, he was awake. All told, we spent 5 hours at the hospital. His hearing is fine. All of this is just texture on our lives. Really things are going fabulously. Cade has his first word. Mama! He's the first to say Mama first, and the first to have a word this early. Camille is finishing her last week of 2nd grade. She worked hard for the jog-a-thon this year and earned trips to Dairy Queen and Camp Harlow. Colby just turned 4 and he wants to be Spiderman or a Skylander.